When we do something, people may notice it. When we do something stupid, everyone will notice it, right? Wrong! Researchers found very interesting results on this topic and even gave a name to this ape-subroutine: spotlight effect. People wrongfully believe that they are in the spotlight of attention and their every move is spotted - and if bad - judged. The studies are conducted very simply: someone is asked to do something, like wearing a stupid T-shirt, or say a dumb argument during a debate. After that he is asked to guess how big percentage of the group remembered his actions. Of course the group is also asked the same thing. The difference is around 600%! So I have bad and good news for you. The bad one is that most people don't give a damn about your existence. The good one is that your fears that this or that action may damage your reputation is pointless. People don't even remember it next day. Let's take for example this poor priest on the picture, whose name is hidden to protect his identity. He is neither slacker, moron nor leech, just someone made something stupid. The story in short: my lvl 78 mage and my girlfriend's prot warri with a friend's lvl 77 alt wanted to go to normal Gundrak for XP and instance quests. We found another DPS on LFG, but no healer in 10 minutes. So I decided to work my magic: "LF1M healer to normal Gundrak, paying 50G"
The chatbox filled purple instantly. Some just said "lol" or asked if I'm serious, however only in a minute 4 healers, all lvl80 offered his services. This priest was special, since he stated that he doesn't want the money, he just want to help. The run was fast and problem-free. My point: I asked the 3 other people next day about the priest's name. None remembered. I only know it from the screenshot. His attempt to get some good reputation was completely wasted. If I see him again, I won't be able to return his favor (like goblins do such things) since I have no idea who he is. Can you recall the names of the ninjas from two months old raids? I don't think so, although they were very annoying once. Now try to imagine how could one remember your little actions, either good or bad! In WoW there is ignore and friend list what we can use. Like with every ape-subroutine we can make conscious effort, using tools to counter it. This case it's putting him to the list. The point of the social psychology is to reveal these subroutines and to create countermeasures. If you use these lists, you are more advanced being than most. Bristal put it in better than I could: "you don't have to worry about your reputation because most people playing this game won't remember your actions". While one can put effort to make notes, most don't and they are easy victims of the spotlight effect. Personal comment: I have to clear my /ignore list over and over since it fills too quick with beggars and "plz boost me" guys. Nice finding. This will be usefull both in WoW and real life. Knowing that total strangers in long run will probably not remember what we did, let us to live less stresfull life. And perhaps it just explain a bit John's Gabriel theroy. But is this research really reliable? Sure if this thing happens only once, no one will remember it. But if such an behaviour repeats over and over again you will probably take notice of it. Sure now you might not remember the priest, but if you get into group with him one or two more times you will probably notice that you have met him before. So sure some ninja might go unnoticed if it happens once. But if on another raid with you he ninjas again he will fall into your memory for a long time and you won't let that happen again. Hmm, while this may very well be true in real life, in WoW there is a very easy way of remembering those who made an impression on you (whether good or bad) - friends/ignore lists. It's even easy to make notes reminding you exactly why that person's there. So yeah, if someone's a ninja, even though I won't remember his name, he'll still be there on my list. I have an addon for this. What it does it gives you the chance to rate people, from 1-100 and lable a comment next to them. Usually if they are in your party you can check their notes, even if they /w you the colour of their name is changed in the /w section. Good actions are easily forgotten. Bad actions however? Yes, I still do remember the names of people who really screwed up or ninjad. Some even from a year ago. Bad actions seem to stick a lot longer. I sometimes craft things for free, port people for free, give things away, or help lowbies on a whim. Not necessarily because I hope they will go tell all their friends how nice I was, but because I like helping people, and I get a warm fuzzy feeling from crafting their coveted item for nothing, or helping them when nobody else would. Nice. There has only been one instance that I rememeber a ninja (in Vanilla Wow). His name was Safiyah on Llane, and he ended up being more famous then Chuck Norris for a good 6 months. I wonder, would they have to remember his name for him to get good reputation? I know I sometimes give priority to people in the LFG channel based on remembering them from earlier experience, when I see their name in front of me. Of course, as a healer priest he might not NEED that sort of good reputation, as he is probably in demand anyway. My experience from doing pick up groups as a healer is that there's a lot of people out there who will add you to friends if you are a good (enough) healer willing to join a random group, just like I add good tanks willing to join random groups. Of course this is building a reputation from common interest rather than from being kind. I do however have a few strangers in my friends list that I've added due to me liking something they did, without having grouped with them first, and who would gain from this if they were ever looking for a healer for somewhere I might want to join for. Although the research is accurate, there are a couple flaws when tying it to WoW. 1. I have a label; the name and guild name. 2. I may or may not remember the name tomorrow. Or the action. 3. I will remember the emotion the next time I see the label (which may include seeing the character in similar gear etc). With a bit of thinking I probably will recall the action, if I have the label (name/guild). 4. The stronger the impression the longer time it will last. Obviously. Example: I can recall people I grouped with as a L30 two years ago because it was fun, when I occasionally see them again they are amazed that I remember them. They may even be able to reminisce about killing ogres in Loch Modan and dark iron dwarves in the Wetlands. Example: I can recall people I dislike from trade channel or other chats/areas if I have to think about it. I think we can all recall the regular hecklers. Example: I still recall a fair number of pug tanks I healed for (not on my friends list). More so the good/active ones than the bad. I recall the good ones, because those are the ones I'd either a) contact when I needed a tank or b) jump at a chance to run with when they needed a healer. Example: Bad players don't leave much of a trace, because the aggravation didn't last long. How the heck do I remember the tank or dps who screwed up my late night Heroic when we never got past the second trash pull? Whereas I can still recall the name of a paladin I grouped with for one run, because his skills were just so far beyond any player I regularly saw. The key is that I need a) the label in front of me and b) some time to recall. It's not instant, nor is it perfect. Other people probably have different criteria for memory, i.e. focusing on ninjas/whatever and it may be due to differences in play style. Rep matters. Especially since the human brain is wired to keep track of famous people (people who are significant in the community), which other research has shown. Well I don't quite agree. If you do things worth remembering you can expect to end up on someone's friends list or ignore list. And your actions will definitly have an impact on the reputation of your guild. The server isn't bigger than that. And there are other perspectives as well on this one. I may end up making a post as a reply. We'll see. Agree with Larisa on this. I do remember the good and bad players I've met through the friends and ignore list. Decent players I've enjoyed playing with goes to the friend's list. Some of whom I remember even without a note on their name. @everyone: text fixed to reply your valid point. "Taking their money by selling them crystallized fire on the other hand..."
From a crafting perspective this is not true. Crafted items have the < Made by Nice-Guy-Who-Didn't-Rip-Me-Off > added onto them to reinforce and remind players of what you did for them. For anyone looking for some help remembering the ninja's and the helpers, I find the friend/ignore list deficient. As Goblin points out, I'll *never* remember the names. I do, however, make an effort to make a note about who did what. The mod "Do I Know You" is the tool I use. I can right click on their name in chat, or their unitframe and put not only a note, but also an 'impression' - either positive, neutral or negative. The mod further shares these notes with others in your guild. My wife and I use it extensively to help ensure a better quality of online time by rating individuals. I completly disagree with you on this in WoW. Why do you think all the drama happened when paid name changes were introduced? My personal experience is counter to what you've said, too. I remember people's names, both the good and the bad. In one case, I denied a guild app because I remembed that the asshat applying had griefed me when I was trying to do that stupid Netherray wrangling daily. People do remember. Hell, every once in awhile I get a whisper from people I haven't done anything with in awhile who saw my name in trade and remembered me. Sorry, on this topic I think you are completly wrong. 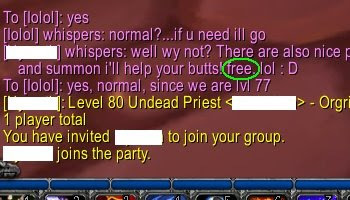 You and your party members may not be able to "remember" the name of the priest who helped you, but you would be more than likely to "recognize" that name if you bump into him in Dalaran. The power of the unconsious is far more than you can rationalize. If you're a recruiting officer for a raiding guild and he apps months down the road, you might not remember who he is or what he did with you, but chances are your mind would conjure up a good image about him for no reason at all. Good point! So why do we still let things like ninjas upset us so much when even in a couple of hours we'll have totally forgotten who they are? On the other hand, there is one infamous person on my server that everyone with an Alliance toon knows and only a tiny handful of his friends even like. Everyone else absolutely hates the kid. I think GG's point is that YOU don't have to worry about YOUR reputation because most people playing this game won't remember your actions, and I mostly agree. Thus, doing something unexpectedly "nice" like refusing a hefty tip for doing an instance run is just plain "dumb" and basically without worth in the world of GG. But not everyone needs or wants to play WoW for some kind of gain EVERY SINGLE MINUTE. Maybe the Priest was just attracted to the unusual request, and running a quick PuG instance with some new people was just as good as whatever he had going on. Or maybe taking money for heals made him/her feel like a whore. An addon I use for helping me figure out where to go for quests has a "social" part called "punks". Add someone to your "punks" list and it shows up on the "punks" list of everyone else using the addon. So when you look at the "punks" list, it'll also show you everyone else in the region that someone with the addon has labeled as a "punk", for whatever reason. its been mentioned already in replies, so feef free to delete my comment if you wish, but. 1. sometimes we do things not becasue we want something in return but becasue it makes us feel good. I once helped a random lvl 40 in STV,, not because I concidered that he might help me i na future, but rather bcasue he was polite, made me laughand I had fun helping him. simple as that. 2.a while good actions take longer to make and impact - they do bring fruit. I belong to a guild that doesn't pvp much as a guild. normaly - its fine with me, since I'm not much of a pvp player. but I really wanted a black war bear. becasue I've made some friends and established a certain reputation - I was invited quietly into a group from a guild who's more active in PVP scene and have been able to get my black bear. I would have never been able to do that have I completely not cared as to how my actions come across to others. 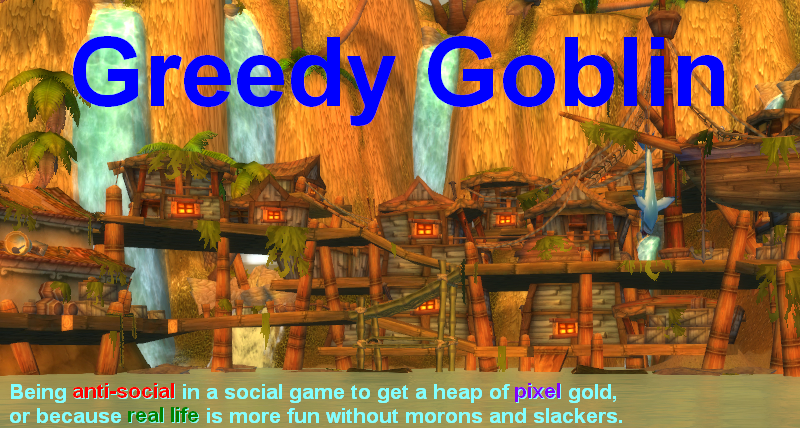 small communities like wow servers are like small towns. gossip travels quickly and while being a healer or a tank might give you more leeway for acting like a jerk or be not very good at your spec and still get groups, sooner or later - people remember. I agree - my memory is a fail, when remembering people I don't have regular interaction with. Nor do I want to fill my friends list with people who aren't friends but aided me. I have done that for a couple of people. Mainly as a form of networking, with notes to jog my memory as to what they did, eg a hunter helping me tag a kill when people were Aoeing a spawn point rather then waiting in line - he made my day- but I don't want to be his friend. I've started adding those people to the mod Do I know you, There is danger in this blacklist/goodlist as it is sycnable to the rest of your guild, and while cateloging the populace of a server might be alot of work, creating a list of safe people to pug with - or people to avoid for variuos reason does make sence. Although I agree on many things with you I will have to disagree here. Kindness most of the times (about 98%) is wasted BUT only kindness can give you the best profit – in case you see it as an investment. Memorable friendship and memorable moments is the true treasure we gain from this game and not some bytes on a server that add some zeros at the end of our gold amount. Just have a moment to think of these words.